The IZOD IndyCar Series’ ladder system, designed to help junior open-wheel talent successfully ascend through the lower formula to Indycars, will be on full display this week. 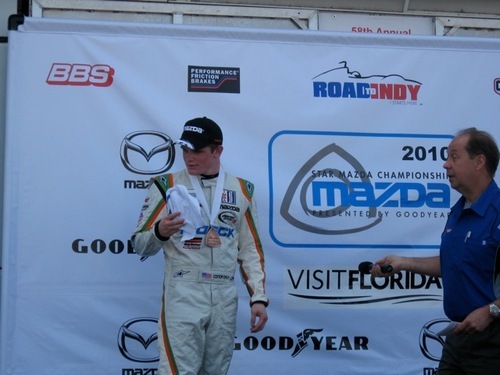 Thanks to multi-series competitors, Andersen Racing, the respective USF2000 and Star Mazda champs will have the chance to test the waters at the next level by lapping around legendary Sebring Raceway in Florida. 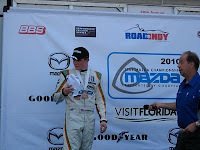 Sage Karam (USF2000) who, by the way, POUNDED his competitors by winning a mere 75% of the races run this season, will be testing a Star Mazda ride, while Conor Daly—fresh from a multi-week GP3 test across The Pond—will trade in his regular Star Mazda drive for Andersen’s Firestone Indy Lights car. Props to Andersen, the respective series, and sponsors involved for making it happen. Cool to see champs rewarded for their accomplishments and get the opportunity to try and take it to the next level. Make the best of it, boys.